Previous Dr. Burke, who are you? – Get to know a Grove, OK eye doctor. Do you have a question for Dr. Burke? Ask him. 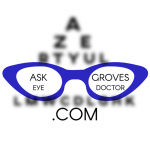 AskGrovesEyeDoctor.com is also on Facebook and YouTube. Dr. Burke is an optometrist in Grove, Oklahoma providing complete eye care services for the surrounding communities. As a licensed optometrist, Dr. Burke has spent the last 22 years practicing primary care and some secondary care optometry. He is certified in the treatment and management of ocular disease and is currently licensed in the states of Missouri and Oklahoma. Dr. Burke received three bachelors degrees from North Carolina State University in 1990 when he graduated with a triple major in microbiology, chemistry, and biochemistry. After enrolling in Pennsylvania College of Optometry, he received another bachelors degree in visual sciences and graduated in 1994 with a doctorate of optometry. With this background, Dr. Burke is trained to recognize a range of health issues; such as glaucoma, macular degeneration, diabetes and hypertension. Dr. Burke works hard to stay current on the latest advances in eye health and vision care and regularly attends continuing education seminars and advanced training courses. It is because of Dr. Burke’s dedication to continuing education that our Grove, OK patients receive the most modern and progressive vision care available. Dry eyes is one of the most common problems seen by eye care practitioners. In fact, 1 out of every 5 American adults suffer from dry eye discomfort. Dr. Burke, having had problems with dry eyes himself, understands this and as an ocular surface disease specialist, he understands how to manage and treat dry eyes. Dr. Burke’s interest lies in a meaningful relationship with God and with his family. He is married and they have been blessed with two children. He also has interest in organic gardening, country living, and a healthy lifestyle. He likes spending time helping his children with their music as well as playing his saxophone. ***Disclaimer: AskGrovesEyeDoctor.com is an information resource only, and it is not a substitute for face to face consultations with your doctor. No action or inaction should be taken based solely on the contents of AskGrovesEyeDoctor.com. If you are in need of medical attention, please schedule an appointment to see your doctor. How do you get stigmatisums? Can you get glasses that allow you to see far and close if you have them? Thank you for your questions. Astigmatism is a refractive error like nearsightedness or farsightedness. All are due to the shape of the cornea. Nearsightedness causes one to have blurry distance vision (better near); farsightedness causes one to have blurry near vision up close. For astigmatism, the cornea is more oval shaped instead of round, and depending on the severity of it, may cause blurred vision both at distance and near. All are usually correctable with eyeglasses or contact lenses. Yes, glasses are available that correct both distance and near at the same time. Yes they are available at Burke Eyecare located at 1105 S. Main Street in Grove, OK right next to the WestCo furniture store.